Ed has designed an exceedingly tiny spindle: the Bee Hummingbird. Just as the Bee Hummingbird is the smallest living bird, the Jenkins Bee Hummingbird is the tiniest functional spindle! 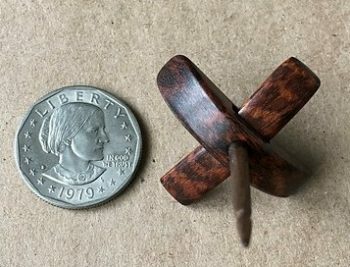 In 2017, after countless attempts and years of trying Ed Jenkins was finally able to achieve his dream of making a super tiny spindle ranging in weight 2 – 6 grams that is balanced and spins well, albeit for a short duration. Snakewood Bee next to a Susan B Anthony Dollar. 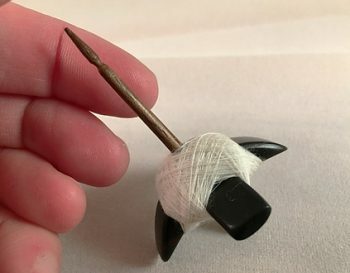 Each Bee will come in a little container with one extra shaft, and an earring shaft/post so you can wear your Bee as an earring! 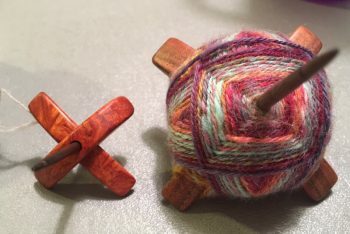 1) These spindles are seriously TINY – they can only spin very fine yarns referred to a cobweb. They are not suitable for anything else. Pictured below: A Bee next to a filled Finch. 2) Ed will not be able to make a new shaft for one if you lose or break it. The shafts are challenging enough to make for each individual bee that it’s impossible to guarantee it will spin well with a new shaft. International- $13.60, no guarantee of delivery once the spindle leaves the USA. Bees will be randomly posted in the Store as Ed makes them.